You are here: Home / Ethnic Groups / The People of Java / Who are the Jawa Mancanegari? The Jawa Mancanegari mainly live in the province of East Java. Mancanegari is a Javanese word meaning “outside the nation.” This name was given to them by past Javanese kingdoms in Surakarta and Yogyakarta. It refers to the fact that they resided outside of those kingdoms. 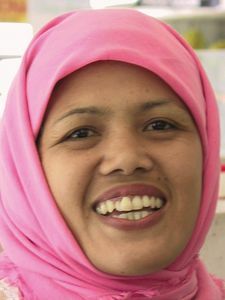 Although ethnographers still use the term “Mancanegari” to identify this ethnic group, the Jawa Mancanegari people simply refer to themselves as Javanese from East Java. They have a rich history of which they are very proud. Two ancient Hindu kingdoms, the Kediri kingdom (11th -12th c.) and the Majapahit kingdom (14th-15th c.), illustrate this heritage. Relics from these eras are found throughout Southeast Asia, but are especially prevalent in East Java. Even today, Kediri and Mojokerto are the centers of Jawa Mancanegari culture. Jawa Mancanegari people are primarily farmers. They have been blessed with extremely fertile land, much of which can support four crops per year. This is due both to the rich volcanic soil and to the many rivers and tributaries which crisscross their homeland. Rice is the predominant crop. However tobacco, soybeans, and corn are also farmed. A growing industrial sector is developing in the major cities, where those who feel they don’t have a future in the villages seek employment. Some of the primary industries include textile, steel, and furniture production. The Jawa Mancanegari are considered less “refined” than the other Jawa subgroups. However, they are known for their openness and straightforwardness, their “can do” attitude, and their strong spirit. Many of Indonesia’s independence leaders, including the first president, were Jawa Mancanegari. Cultural events and ceremonies include the Reog and Kuda Lumping dances. During these dances, the dancer will go into a trance by inviting spirits to enter into his body in order to perform extraordinary acts. In the Reog Dance, the dancer wears a giant tiger-head mask decorated with peacock feathers that is 2 m. tall and weighs about 45 kg. Most Jawa Mancanegari call themselves Muslim. However, most mix Muslim beliefs with Hindu and Pre-Hindu beliefs. This mixture of beliefs is called Agami Jawi or Kejawen. Many of them learn to read the Quran and vocalize prayers and Quranic recitations in Arabic. However, they seldom understand the meaning of what they are reading or vocalizing. They often use the Islamic prayers as mantras and written verses from the Quran as good luck charms or to ward off evil spirits. Most of them give sajian (offerings) to the Danyan (guardian spirit). They believe he watches over the village in order to ensure their protection and well-being. Jawa Mancanegari need more employment opportunities due to the high unemployment rate among them. As farmers, they have needs for new farming techniques. They also need to return to traditional organic farming, due to soil problems from the over-use of chemical fertilizers. Also, outside of the major cities, any type of medical care is basically nonexistent and educational opportunities are very limited.